Okay. So after a string of churches at Nos 16, 17, and 18, we get, at No. 19, a tree. 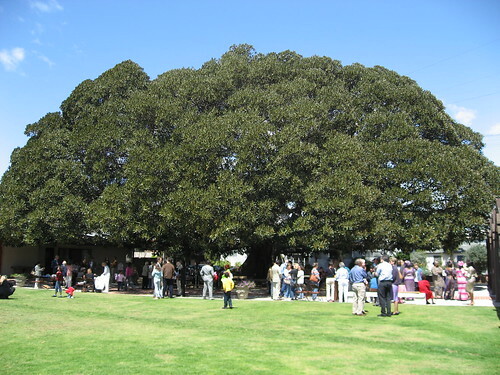 Now, it’s a big tree, a Moreton Bay Fig Tree, a Ficus macrophylla, an Australian evergreen, planted in 1875. 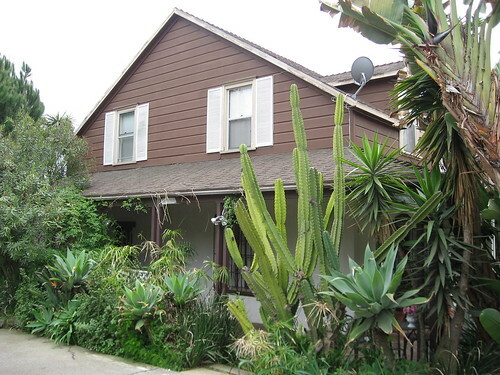 McGrew and Julian, in Landmarks of Los Angeles, report it was planted by the Smith family, shading their La Balloona Ranch cottage. It’s now part of the grounds of St John’s Presbyterian Church in Westdale, and it still covers the area with figs after all these years. 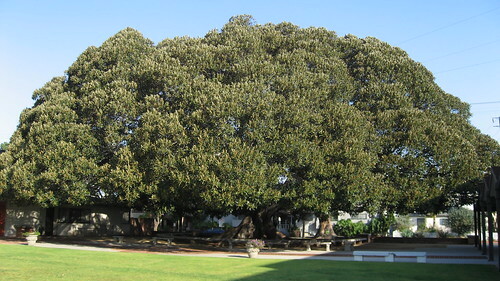 As big as this Moreton Bay Fig Tree is, it’s not in the same league as the ones in San Diego and Santa Barbara (the largest in the nation). 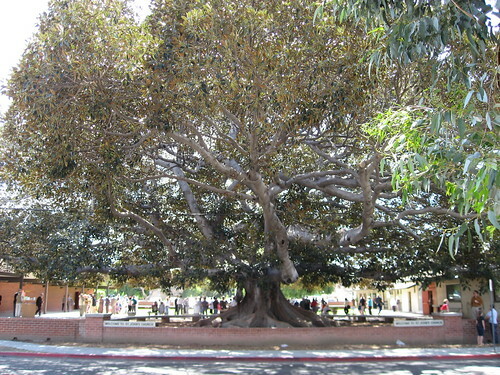 Both of those are listed in the California Registry of Big Trees. 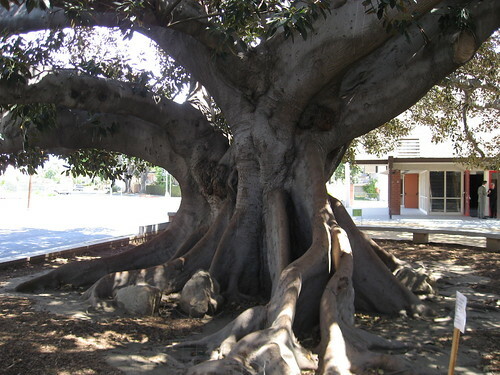 If Moreton Bay Fig Trees rock your world, go see the beauty at Santa Monica’s Fairmont Miramar Hotel. 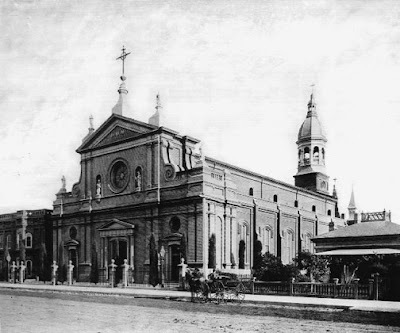 The Cathedral of Sancta Vibiana, modeled after the architecture of Puerto de San Miguel in Barcelona, was built in the 1870s on land donated by a guy named Amiel Cavalier. 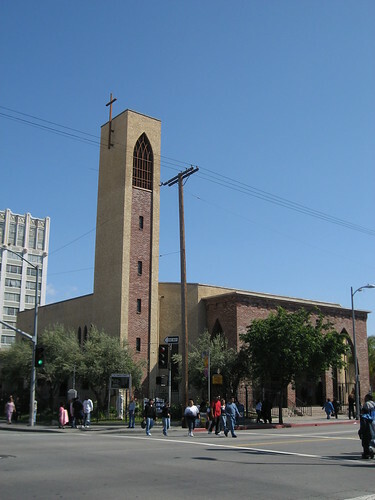 Opening on April 9, 1876, it became the home of the Archdiocese of Los Angeles and it replaced Iglesia Nuestra Señora Reina de los Angeles as the city’s main Roman Catholic church. Pope Pius IX named St Vibiana’s for a third century martyr (the martyr St Vibiana - the poor girl was flogged to death). With the help of its 83-foot bell tower, the Spanish-Baroque church instantly became a dominant part of the city’s skyline. ... the first corner-stone had been placed, on October 3rd, 1869, on the west side of Main Street between Fifth and Sixth, when it was expected that the Cathedral was to extend to Spring Street. The site, and that oddly enough, was soon pronounced, "too far out of town", and a move was undertaken to a point farther north. In 1933, a five-story rectory was built on the Second Street side with living quarters, kitchens, dressing areas, and balconies. 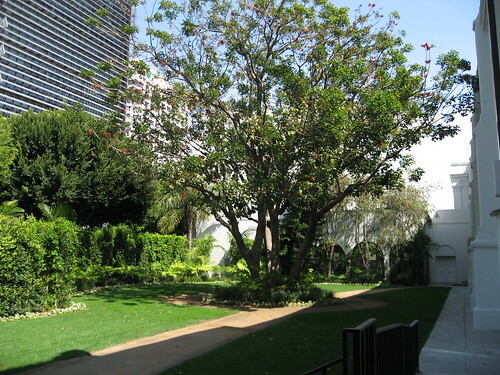 Pope John Paul II stayed there during his 1987 trip to Los Angeles. 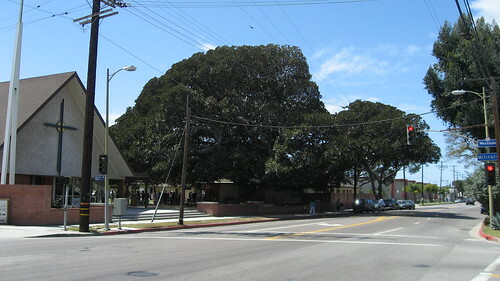 This big pit between me and the church was, until it relocated at the end of 1994, the site of the Union Rescue Mission. After the 1994 Northridge earthquake, parts of the cathedral were severely damaged. 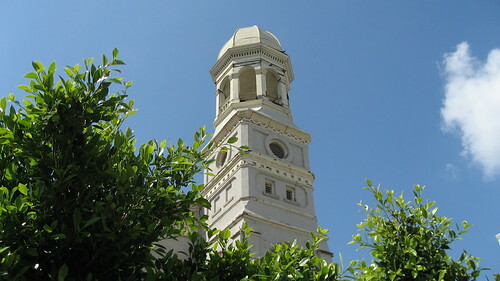 In 1996, the Archdiocese of Los Angeles began demolishing the structure, starting with the bell tower, to make way for a new church. 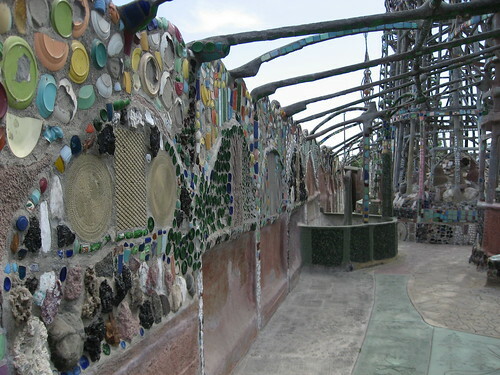 The Los Angeles Conservancy and executive director Linda Dishman, with support from Antonio Villaraigosa, then Assembly Speaker and a former Vibiana altar boy, State Senator Tom Hayden, and State Senator Gil Cedillo, opposed the destruction. A pair of lawsuits halted demolition. 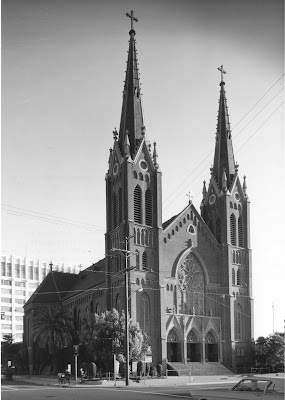 However, Cardinal Roger Mahony threatened to move the cathedral out of downtown L.A. if he couldn’t raze and replace old St Vibiana’s. 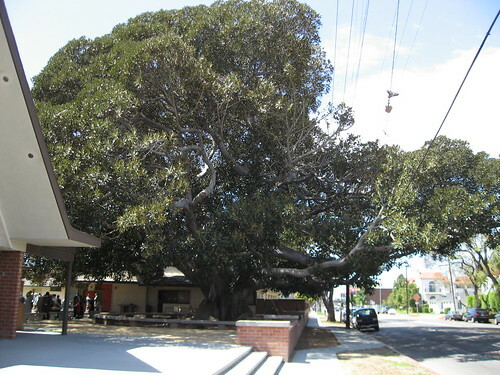 A shot of a branch from the city library's Little Tokyo branch, formerly the site of the cathedral's school. 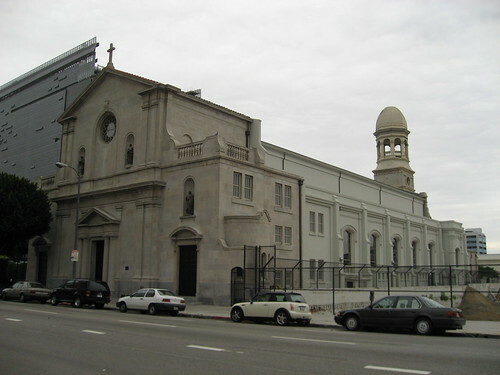 The archdiocese ultimately backed down when, first, it acquired from the city a plot at Temple and Grand for a new church (Cathedral of Our Lady of the Angels opened in 2002) and, second, developer Tom Gilmore stepped in and bought St Vibiana's for $4.65 million. (More money: the 21st-century cathedral cost around $200 million; the 19th-century church around $80,000.) Read an account of the archdiocese/preservationists to-do here. 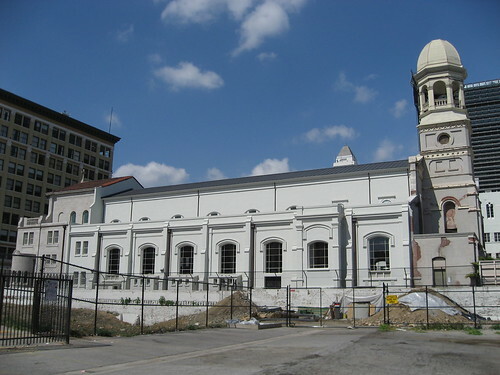 After a restoration and seismic retrofitting costing around $8 million, the building was re-opened as an events center, Vibiana Place, with a big wing-ding on November 12, 2005. As late as last fall, Gilmore's plans for the site included a restaurant in the rectory, the performing arts center in the church, and an adjoining 41-story building with 300 condos. 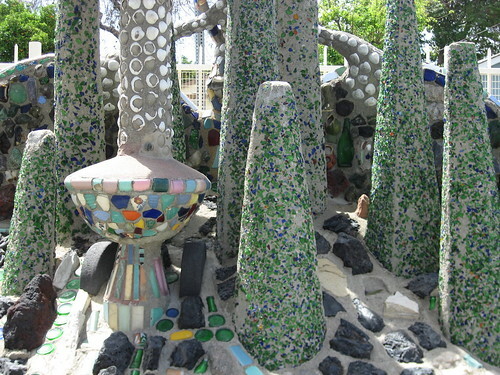 When I was there, the place was shut up pretty tight, so I didn’t get any pictures of the inside. But if you go to the Vibiana Place website, you’ll see some great interior shots. 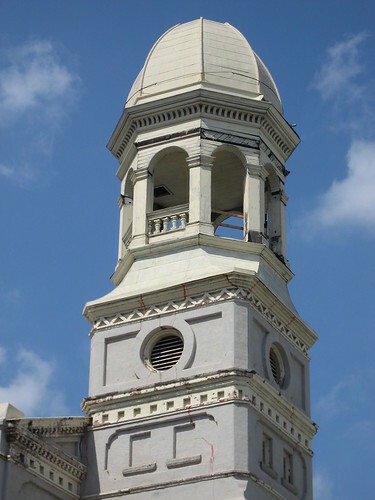 8/29/07 Update: Click here for a Los Angeles Times article, with footage, on the restoration of the 3,500-pound cupola. Okay. The first thing you should know about St Joseph’s Church is that it isn’t there anymore. It burned down just before first Mass on September 4, 1983, due to a glitch in the subfloor wiring. No one was injured, and the adjacent rectory with its twenty-one Franciscan priests wasn’t damaged. The roof collapsed, but the brick walls and the two five-story bell towers remained standing. Also, some things inside were spared, like the lead in the stained windows, a couple of statues and pictures, confessional doors, a few pews, and the antique vestments. 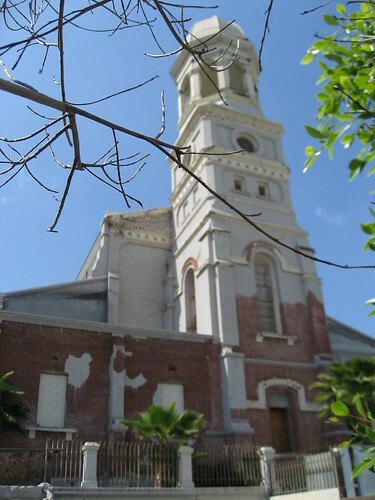 The Cultural Heritage Board tried to convince the archdiocese into at least incorporating the remaining steeples and walls into the planned replacement church, but, in mid-October, the city approved a demolition permit saying what was left of the old church was a safety hazard to the public. Believe me, I don’t expect you to read this, but the following is a Los Angeles Times article from March 12, 1903, preceeding the church's original dedication. While every reference I could find gives the 1901 date for St Joseph's, that's actually the year for ground-breaking, while 1903 is the year the church was completed. GRAND DEDICATION FOR ST. JOSEPH’S CHURCH. APOSTOLIC DELEGATE D. FALCONIA TO OFFICATE. Church Dignitaries from South and West Will Be Present—Rich Interior Furnishings—Wonderful Fresco Work and Art Work from Europe. 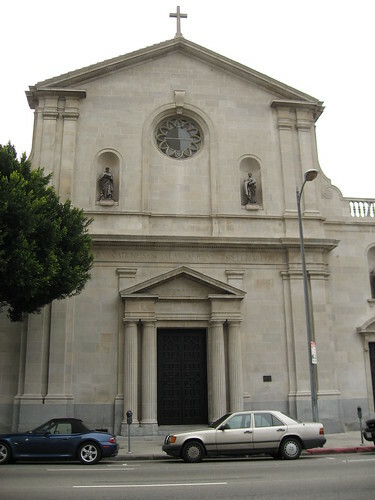 Behind the closed and barred oak doors of the new St. Joseph’s Church, at the corner of Twelfth and Los Angeles streets, a great transformation scene is in progress. The vast interiors of the great church is a labyrinth of trestles and scaffolding, reaching clear to the crown of the ceiling, sixty-two feet from the main floor. But peeping through the interstices and lattices of the heavy timbers, one may discover a wondrous work of gilt, and the deep tones of reds, greens, blues and yellows assembled with an artist’s touch into a magnificent whole. This extensive fresco work, said to be the finest on the Coast, is being wrought out by Prof. William Kloer and his corps of assistants, who came from St. Louis, Mo., for this purpose. Prof. Kloer has spent years in this line of work, and has been in charge of the decoration of some of the finest Catholic buildings in the United States. For almost three months these men have toiled on the extensive work at St. Joseph’s sometimes far into the night, and they count on a full three weeks of hard work yet before the frescoing will be completed. While the walls have been receiving most of the work, there are yet to be painted several scenes on canvas, which will adorn the great arches in the center of the ceiling. Two large medallions, eleven feet in circumference, will have the center spaces, on being a scene of St. Joseph blessing Pope Pius IX, and the other St. Francis receiving the indulgence. When all the appointments of the new St. Joseph’s Church are in place it is said there will be no finer church edifice on the Pacific Coast. The whole building is to cost $100,000, and aside from this the furnishings make no small item. Seven beautiful altars will be placed in the new building. These have been made in Munich, and are now in New York. They are of white walnut, and finished in white and gold. The main altar, of pure Gothic design, is forty-seven feet high, and the side altars are thirty and twenty-eight feet high. The communion rail is also to be of polished walnut, with marble top; and the pews will be of white oak. They will seat 100 people. Probably few people who have gazed on the two prominent spires of St. Joseph’s Church, which are landmarks all over the southeast section of the city, have realized the immensity of the new building. The main body of the church is 150x66 feet, and the transept is ninety-six feet wide. Back of this are the sacristy and rooms for altar boys, etc. The building has a large basement, fitted up for a hall, Sunday-school rooms, etc. Attached to the church on the east is the house of the Franciscan Fathers, which they now occupy. The plans for the whole where prepared by members of the Franciscan order, Brothers Adrian and Leonard, and the construction has been under the general supervision of Rev. Father Victor, O.F.M. The new building is to stand as a monument to the Franciscans. 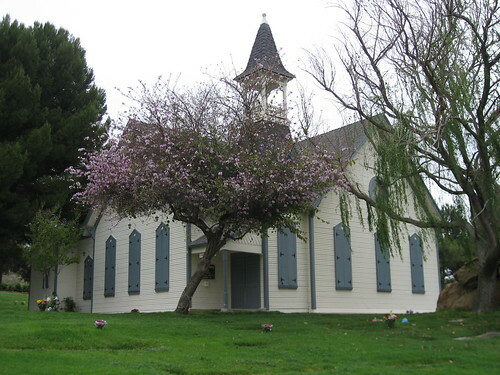 Its corner-stone was laid by Bishop Montgomery June 16, 1901, and work has progressed continuously since that time. The dedication of the new church will occur May 3, on the Feast of St. Joseph, the patron of the church. It will doubtless be one of the notable events in local Catholic history. Exclusively for the purpose of officiating at this dedication, the Most Rev. D. Falconia, apostolic delegate to the United States, will come from Washington, D.C., accompanied by the auditor of the delegation and other church dignitaries. The apostolic delegate is himself a Franciscan, and it is especially fitting that he perform the dedicatory service here. Others who will assist in the service are Most Rev. Archbishop Montgomery, Rt. Rev. Bishop Grace of Sacramento, Rt. Rev. Bishop Peter Verdeguer of Brownsville, Tex., and delegates from most of the nine Franciscan houses in the West. 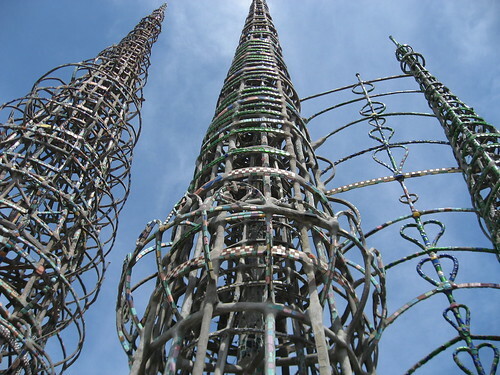 Officially named the Towers of Simon Rodia, HCM No. 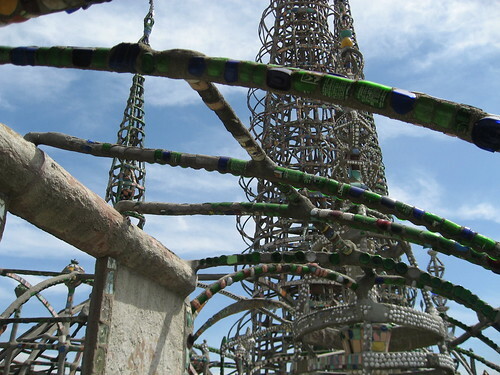 15 is better known to you, me, and everyone else who’s ever heard of them as the Watts Towers. 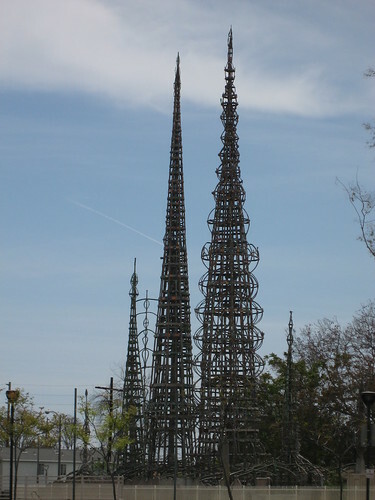 These towers have got to be among the most photographed of all the Los Angeles monuments, but you can’t really appreciate this landmark by looking at a picture – you need to stand there, in what was one guy’s yard, to grasp the work of that one man. 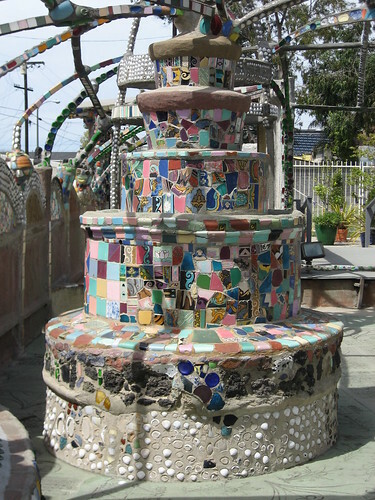 That one man was Simon Rodia, an Italian immigrant who spent time in Pennsylvania, Seattle, and Long Beach before settling on this triangular plot of land in Watts. In 1921, at the age of 42, wanting to do “something big”, he starts his monument by slapping up the walls first, using mainly bedsprings as structure. He calls his work Nuestro Pueblo (Our Town). Then, beginning within the narrower, east end of the wedge, he constructs the “Ship of Marco Polo”, a replica boat with a 28-foot spire. What did he use to build these monuments? Well, what didn’t he use? For starters, Simon didn’t use bolts or rivets, and he didn’t weld. 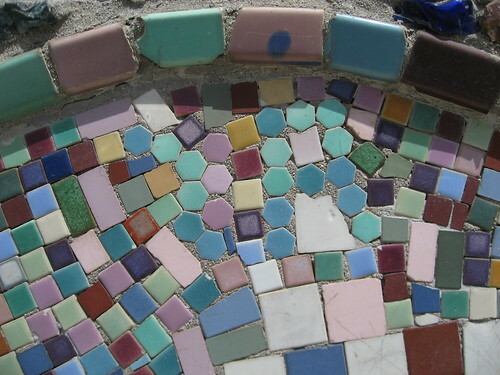 However, he employed pieces of porcelain, ceramic tile, bottles, shards of pottery, scrap metal, rocks, china, sea shells he hauled in from the coast, and broken glass. (Man, I wish I would’ve owned stock in 7-Up and Milk of Magnesia back in the thirties – I’d be paying someone to write this post today.) 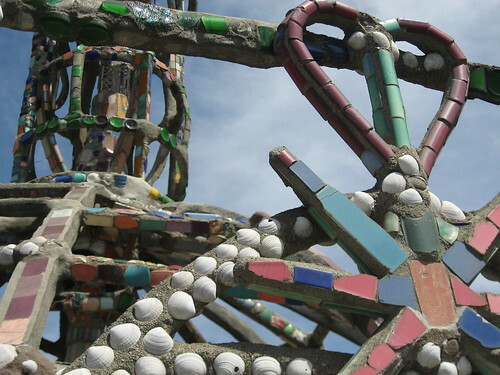 He used steel pipes, steel rods, wire mesh, cement, and mortar for support. And if the three towers weren’t enough, he also constructed fourteen other structures within, including a patio, a gazebo, a fountain, and a bunch of bird baths. Within the mix, you’ll see lots of hearts, Simon’s initials, and the dates of 1921 and 1923. The tallest tower reaches just under 100 feet. Inside of the north wall. Even the ground/floor is engraved. 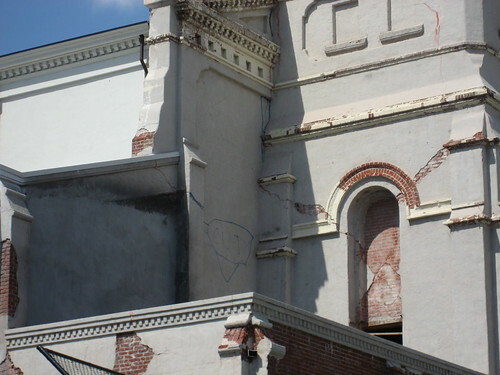 Rodia began adding those buttresses afer 1933's Long Beach earthquake. 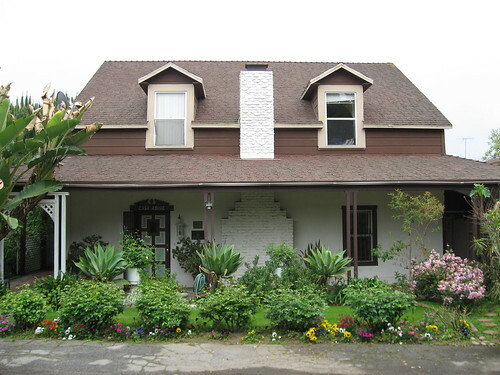 Jump to 1954, and, project completed with his life’s work now a burden, Simon packed it in, gave his property to a neighbor, and lit out for Northern California. He died there in 1965, having never returned to his Watts home. 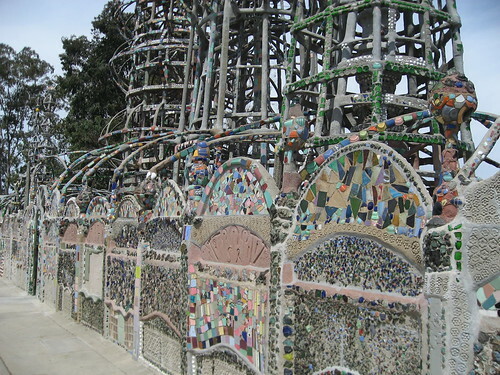 Simon Rodia was about 75-years-old when he wrapped up. That makes it even more remarkable that he never used any scaffolding to build the towers. 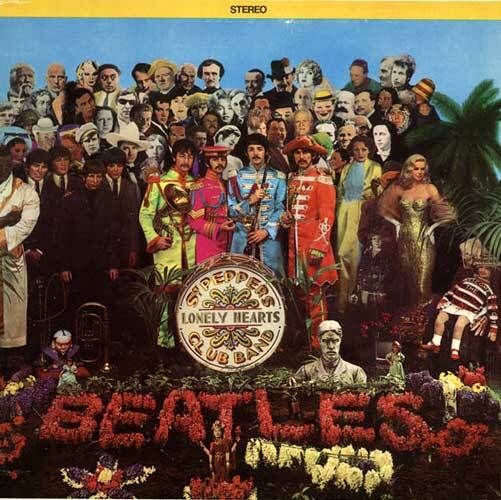 Of course, today Simon Rodia is best remembered for standing between Huntz Hall and Bob Dylan on the cover of the Beatles' Sgt. Pepper's Lonely Hearts Club Band album (upper right-hand corner). 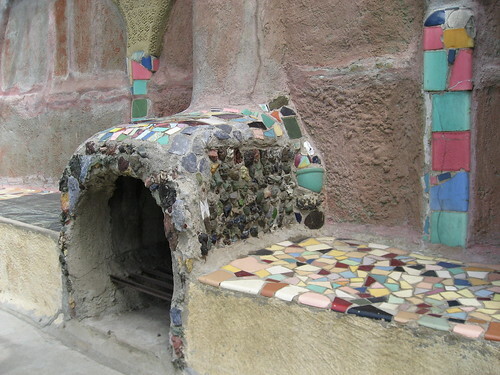 Rodia’s house, adjacent to his art, burned down from an errant firecracker a year or so after he moved out. In the late-50s, the city was eager to pull down the towers for safety reasons, but a subsequent stress test was passed with flying colors. The site remained unscathed during the '65 riots, too. 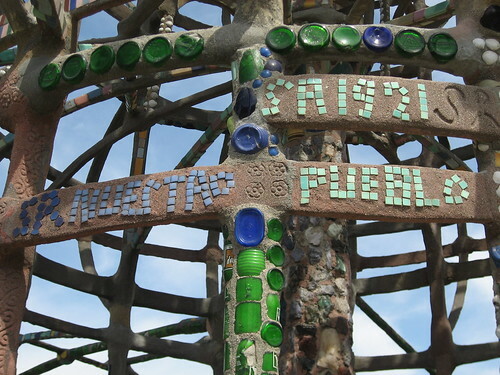 However, the 1994 Northridge earthquake proved more debilitating, and the site was shut up until restoration could be completed seven years later. 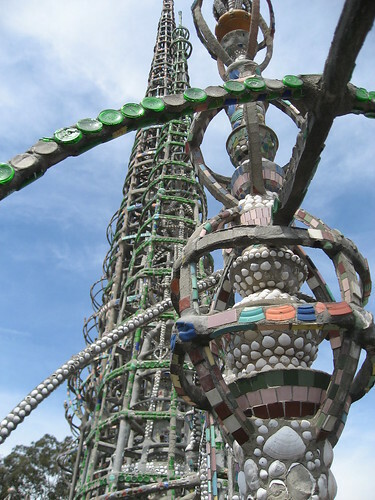 The Towers of Simon Rodia are now part of the California State Parks system (it's the smallest State Park) but are overseen by the Los Angeles City Cultural Affairs Department. 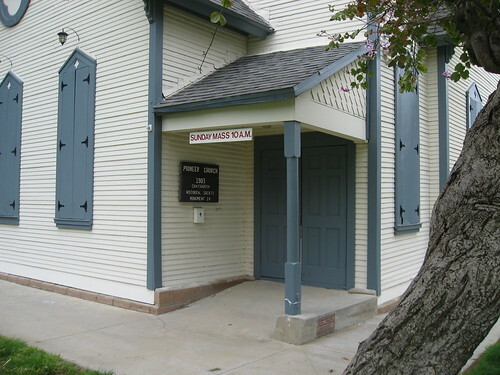 Listed on the National Register of Historic Places and designated a National Landmark, the site’s open for touring. 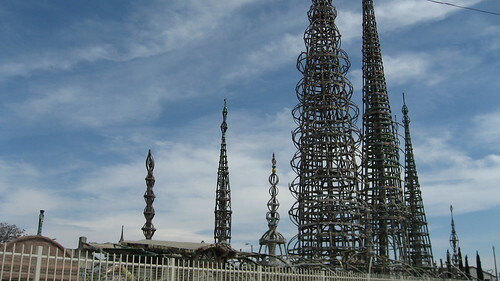 So head to Watts, cough up the $7, and see Rodia’s work of art in person. This is the oldest public building in Chatsworth, and, standing outside it, you’ll forget you’re in Los Angeles, imagining instead you’re somewhere in New England. I mean, even the weather was New English when I was there. 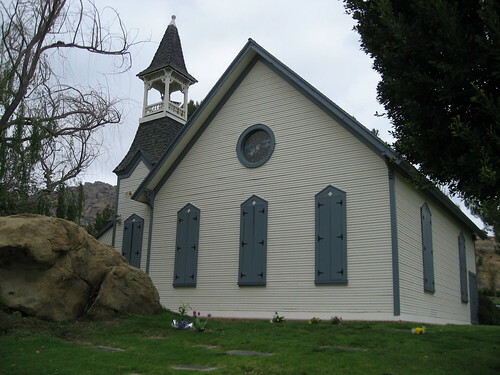 Early in Chatsworth’s history (in the latter half of the latter half of the 1800s), an informal congregation held services where they could: out in the open; in a schoolhouse; in each other’s homes. 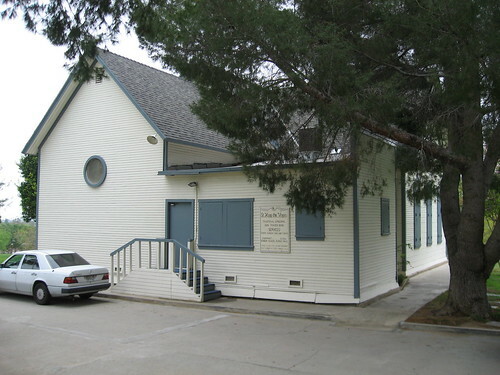 A formal congregation called the Methodist Episcopal Church was established in 1888. Just after the turn of the century, Nelson A. 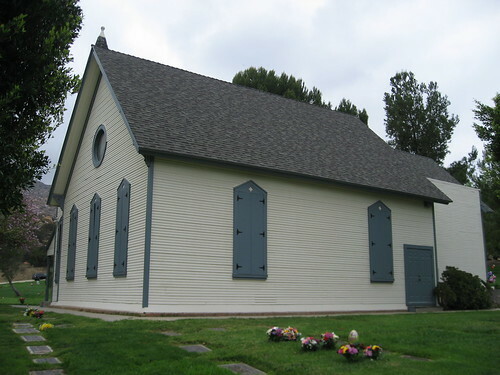 Gray donated land at 10051 Topanga Canyon Boulevard for a church to be constructed. Expanding the meeting space, the White Oak Hall part of the building was added in the early 1920s. 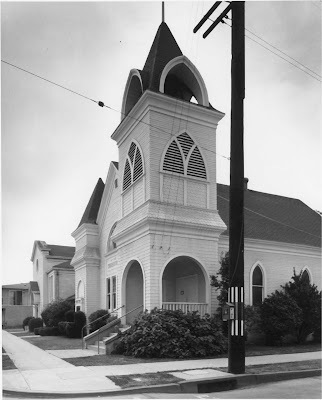 The building was renamed the Chatsworth Methodist Church in 1959, and soon after was abandoned for a larger building. 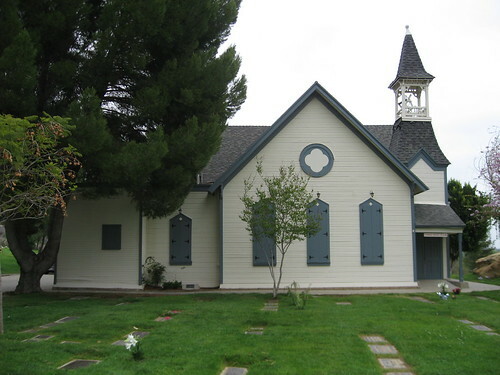 When a new owner announced plans to demolish the structure for a shopping center, the Chatsworth Historical Society was formed to push for the church’s official historical status. After designation in early 1963, the building was donated by the owner to the Society, provided they move it off the property within a month. 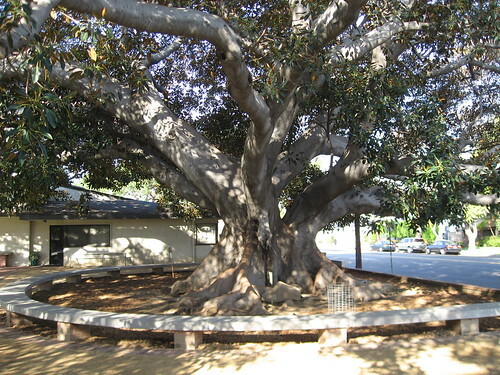 It was relocated inside Oakwood Memorial Park in January of 1965. Rehabilitation to the old church was slow going what with lack of funds and excess of vandalism. While rededication ceremonies were held in 1976, it wasn’t until five years later that a new congregation began to hold services here. Since that time, the congregation of St. Mary the Virgin Anglican-Rite Catholic Church has occupied the building. 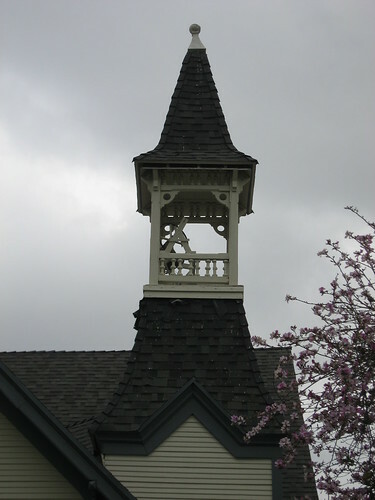 This newer bell’s history with the church goes back to 1993. I would have loved to have nabbed a peek inside the church, and I figured early afternoon on Easter Sunday would’ve been a good time, but it was locked up. However, the Chatsworth Historical Society holds an open house from 1:00 p.m. to 4:00 p.m. the first Sunday of every month. A detailed history of Pioneer Church, from where much of the above information (like that block quote) was gotten, can be found here. 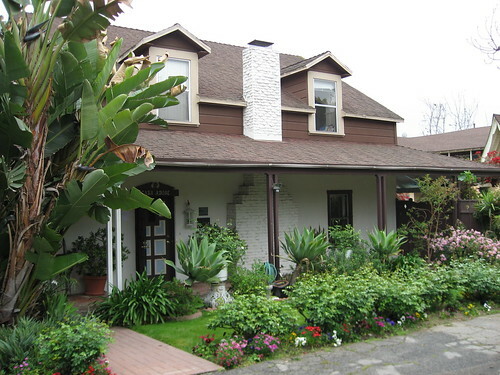 And go see the homepage for the Chatsworth Historical Society. Finally, Lila Swartz Schepler’s 1988 history of the Chatsworth United Methodist Church is here. First, two things about the pictures. One, no photography’s allowed inside the house. 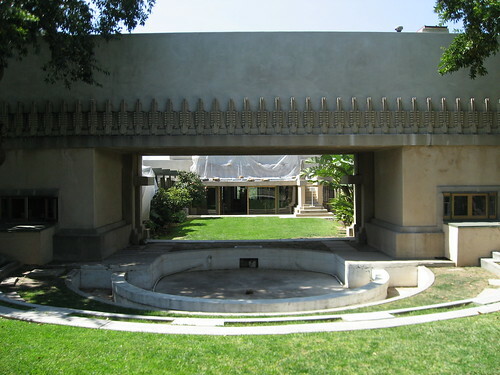 Two, a lot of the definitive shots of Hollyhock House out there are of the building’s broad westside. The day I was there, though, this area was off limits as the ground was all torn up having been the staging area for the site’s recent reconstruction. It should be re-landscaped by the end of the year. During World War I, oil heiress Aline Barnsdall hired Frank Lloyd Wright to build for her a bunch of buildings for a giant art colony on her 36-acre Olive Hill estate in Hollywood. Included in the plans were a home for herself and her little daughter, Sugartop, “two secondary residences, a theater, a director's house, a dormitory for actors, studios for artists, shops, and a motion picture theater.” (Had things turned out the way they were supposed to, you’d see artists’ garrets along Hollywood Boulevard where there’s now the Barnsdall Art Park parking lot.) 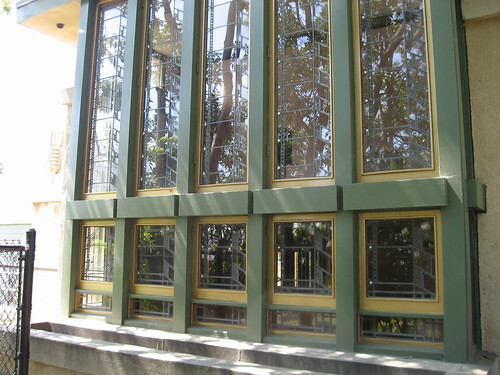 Wright by this time was already famous for all those prairie houses, but this was his first Los Angeles commission and only his second in Southern California (the first being the George C. Stewart House (Butterfly Woods, 1909) up in Montecito, now lived in by writer T.C. Boyle). AB and FLW didn’t get on well. Part of the problem was Wright was spending a lot of his time traveling back and forth to Tokyo where he was building the Imperial Hotel. 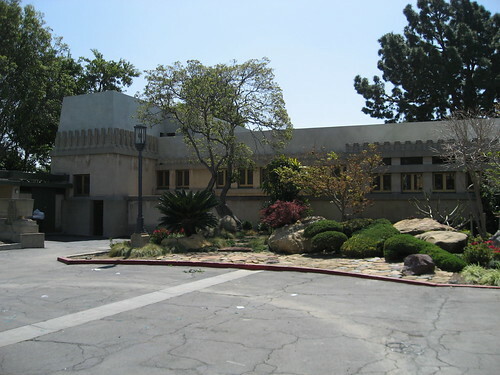 The upshot was just three buildings were completed – Barnsdall’s home and the two Studio Residences, A and B. 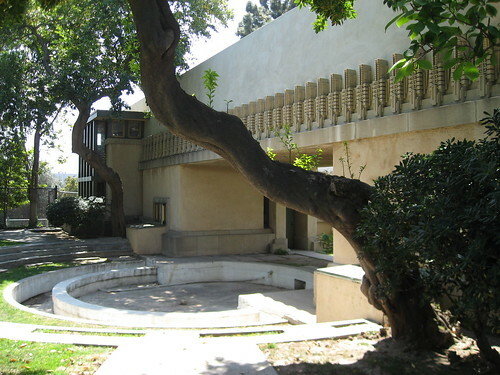 However, he did get some not-too-shabby help on the projects, mainly from Rudolf Schindler. 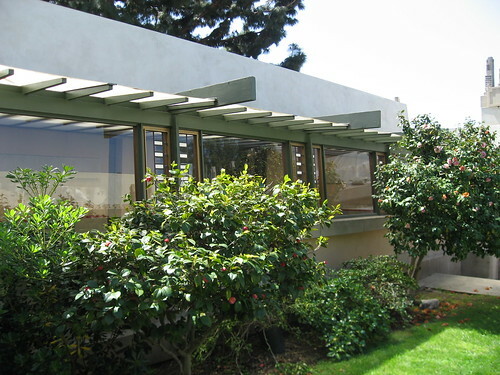 Richard Neutra and Wright’s son, Lloyd, also get points for assists. Aline Barnsdall wasn’t too happy with the way things turned out, and, also citing financial concerns, she moved out of the house after about a year and a half. (She did visit over the years, staying in Studio Residence B. She passed away in that house in 1946. That building has since been demolished.) 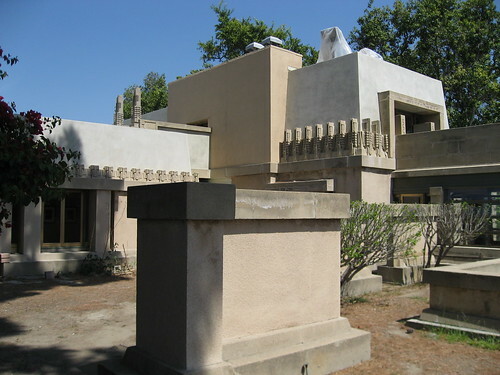 Hollyhock House was donated to the city in 1927, and was used for a few years by the California Art Club. 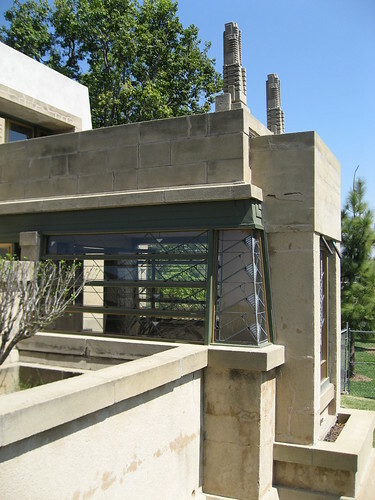 After some years of deterioration, the house was renovated by Lloyd Wright for the USO. Another rehabilitation project kicked off in the mid-70s. Besides seeing the hollyhock theme, you’ll notice the dark-green color outside and inside the house as a nod to the site’s previous life as an olive grove. (Speaking of the inside. Cool: there are both built-in cabinets for Aline’s record collection and a moat around the fireplace. Not-so-cool: be prepared to do a lot of stooping.) All the original glass in the house was provided, for just a few hundred dollars, by Judson Studios. The Los Angeles-based company is still involved with the site today. 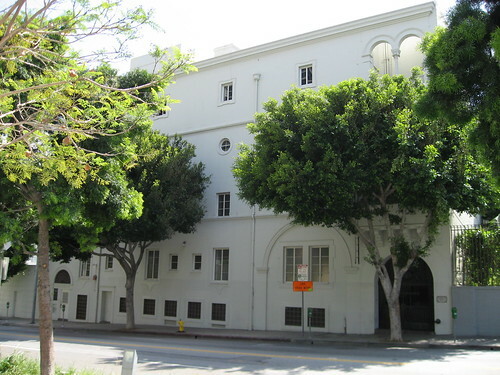 Residence A and the Barnsdall Art Park itself are also L.A. HCMs, Nos 33 and 34. 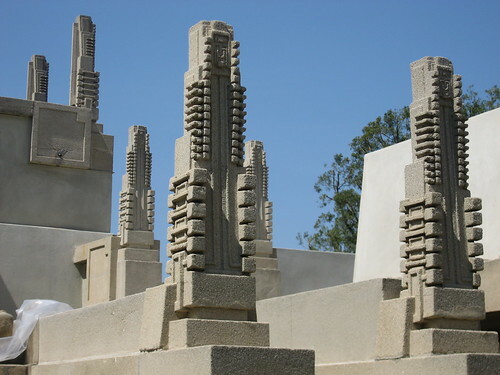 A lot of the information above, including that quote in the second paragraph, can be found on the Hollyhock House's official website. 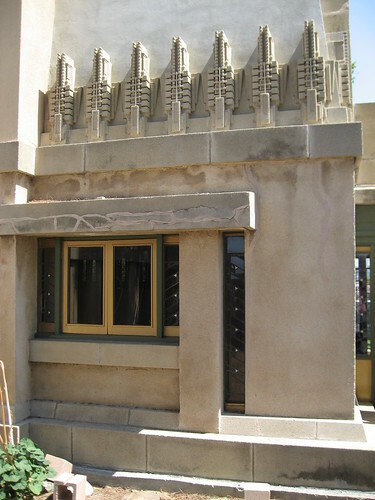 Today, Hollyhock House is operated by the city’s Cultural Affairs Department and is open for tours. 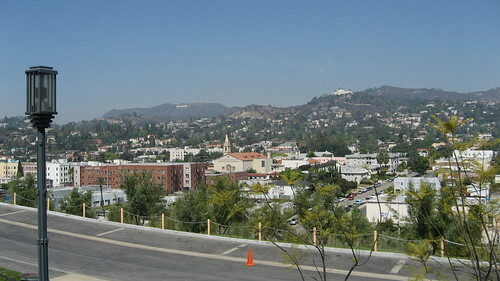 You really should visit Barnsdall Art Park, if only for the expansive view of the Hollywood Hills and Orange Traffic Cone No. 318. Two final notes. 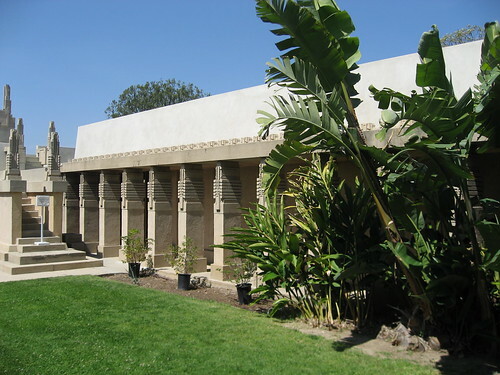 Just last Wednesday, April 4, Hollyhock House, along with a couple other FLW projects, was designated a National Historic Landmark. Also, today, 4/9/07, is the 48th anniversary of Frank Lloyd Wright’s death. I’m sure if he were alive today, he’d still be an S.O.B. But! he’d be a 139-year-old S.O.B.